3 Reasons For Vegan Immune & Gut Issues How I Solved My Health Crisis | RE: Ex-Vegans – Carbundance ~ Carbs & Life in Abundance. Hey what’s up, Miri here. In this post and post series, I’m opening up about the health issues I’ve fought over the past years and how I’ve recovered and managed to still be vegan – and not only that but thrive as a vegan. While fixing my gut, immune & hormone health. I’ll share the reasons for my health struggles with you so you can too – if you want. So if you (or a friend) are struggling on a plantbased diet, this post is for you (or your friend). I wouldn’t be angry about sharing it. 🙂 After 5 ½ years, I’m thriving. After all. Finally. I can’t believe it took me that long thrive on a plantbased diet… and if I can help one person to get thriving sooner, this post series fulfilled its purpose. I think the reason why ex-vegan videos on YouTube are so viral, popular and in great demand these days must be that many vegans are desperate right now, struggling with health issues and being sicker than before (like I was) instead vice versa what they expected. That’s why I feel called to share my story in the hope that I can contribute further possible causes for vegan health crises for those who suffer and are close to seeing themselves forced to stop eating plantbased. Can we please stop the debate about plant based and vegan? We know the difference. Between health and ethics. Veganism is not a way of eating. Never was, never will be. But when it comes to surviving or not surviving – I think we should all be on the same page and that whole differentiation is not right. Everyone that doesn’t eat animal products, is contributing a huge part to saving animals and the planet. Can I say that it doesn’t matter for which reason they choose to eat this way please. In the end. So vegans health often deteriorate after 2 years. When their energy drops, they choose to ignore it, when their hair falls out, they choose to ignore it. They ignored it when they fasted for 3 months and re-introduced food. They realize what they have been missing is the magic chicken egg. Being vegan is about taking the time and work to understand what your body needs.﻿ Antibiotics, contraceptives, other medications, stress, pesticides, low stomach acid, pancreatic enzyme deficiencies, they all add up. And when your digestion starts to suffer, the compounds and fiber found in plants create issues. But how did we get here? Where did it start? I personally found the answer to my personal cascade of health problems. I’ve been there. I’ve done that. Thinking that I had to stop being vegan to save myself first from dying away before I save others. And yes I really was an ethical vegan. 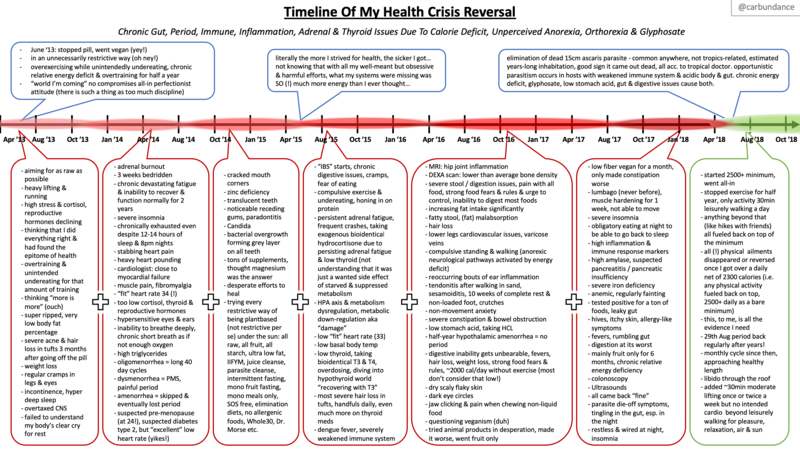 (click to enlarge) This is the timeline of my health crisis reversal. Symptoms (in red) added up over time and everything got worse. All my symptoms either showed up on a blood test or saliva test with clear markers. Nothing self diagnosed. The problem with self-diagnosed is that it’s self diagnosis. There’s no proof that you had what you think you had. Naturopaths are no replacement for medical tests. I’m vegan for 6 years in May. As you can tell it’s been a rough road. Because I made a whole lot of mistakes. Without knowing. And despite aiming to do everything right. Or maybe rather because of that… I believe that me being so open and vulnerable about this will help other vegans who struggle with their health to not only get their health under control but finally thrive. Glyphosate – the most common toxic pesticide sprayed on the majority of non-organic food. All three might be thrown around a lot but hear me out, they’re mind-blowing. You certainly want to stick around all the way through. The third one will blow your mind, it isn’t brought up very much and needs much more media presence than it does now! If anything in my timeline that applies to you and you can relate and you struggle with this – this series might save your life. Not exaggerating. I’ve recovered within a week, being vegan, from all symptoms and am symptom-free for 6 months now, all by eliminating the 3 causes. I’m doing a whole video on each one of them. I might do a video on Bonny’s and Tim’s symptoms as I had most of them as well. I know how it is to be desperately desperate. I tried everything. All remedies in the alternative medicine world. Wanting the vegan diet to work but being the only one having health issue after health issue in my own surrounding, despite being on „the perfect diet“… I’ve learned tons. I now understand my body and why all these diseases had to happen. My body was always doing the right thing. The body always does the right thing to keep you alive. If anything goes “wrong” in your body – it is for a reason. No exceptions. And then glyphosate. Such a huge cause of gut & immune issues as it acts as an antibiotic. My goal is not to convince anyone of anything but to just share insights that I had that enabled me to reverse vegan health struggles – for those who are struggling as well and are utterly confused and questioning everything. I’ve been there. I’m not saying I have all the answers – but I might have valuable experiences that someone connect some dots. That it’s maybe not the vegan diet in their case and not impossible to get healthy again as a vegan, staying vegan. I’m just here to provide some missing puzzle pieces for those finding themselves in my health crisis timeline. Definitely take a close look at it if you’re struggling. As I’ve reversed my health crisis while being vegan, my own experiences make me assume that it’s not the vegan diet itself, in my case, that caused me the problems but rather a wrong way of going about the vegan diet, and that is insufficient calorie intake, food fears / orthorexic approach and glyphosate – all unknowingly and unintended. You live you learn. My health crisis has been so similar to so many ex-vegans’ stories in the last years and I was forced to question a plantbased diet at times, but I managed to fully recover from all my symptoms and diseases on a vegan diet. I gave myself a last serious attempt and chance (after many before) putting what I’ve learned to the test because it blew my mind so much sense it made to me. It would be irresponsible for me to not offer my own insights that I gained due to my crisis and share it publicly, so everyone can make their own opinions about it. It’s always important to ask yourself and find out why you have the gut issues, intolerances, allergies and reactions in the first place. It always comes down to a weak immune system or weak digestion process. Both of those are traceable to chronic energy deficiency (equals nutrient deficiency automatically) and/or toxic damage by glyphosate. For example I was diagnosed with several intolerances: soy. But I knew that I was not gonna avoid those. I knew that to reverse my problems was that I eat calories. And I put it to the test. And I reversed everything. I’m symptom-free for a half year now – and wouldn’t it be great if you could say the same in a half year…? Now I’d be interested to hear what you personally are struggling with and what your thoughts and questions are. Leave a comment below and I’ll see you next video. I’m trying to upload once a week. I’ll see you soon! Eating Disorder, The Reasons for Vegan Health Crisis amenorrhea, anorexia, anorexica recovery, bonnyrebecca, calorie deficit, carnivore, clean eating, diet, dieting, digestion, eating disorder, eating disorder recovery, ex-vegans, food fears, glyphosate, gut, hormones, iifym, lose weight, macros, metabolic damage, metabolism, metabolism recovery, obsession, orthorexia, period, plant-based, restriction, restriction recovery, vegan, vegetable police, wholefoods, why i'm no longer vegan, why i'm still vegan. permalink.